Putnam Publishing Group, 9780399256813, 32pp. From debut picture book author L.J.R. Kelly, and acclaimed illustrator Yoko Tanaka, comes a poignant ode to well-loved toys in the vein of picture book favorites such as The Velveteen Rabbit, The Giving Tree, and Knuffle Bunny. 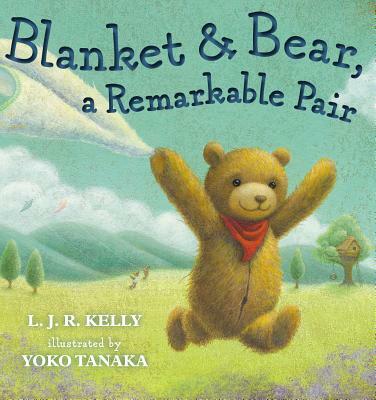 Blanket and Bear have always gone everywhere with their boy--but one day they are accidentally left behind. On a daring adventure across oceans and faraway lands, they travel to find their way back to the boy, meeting new friends along the way. L. J. R. Kelly was born in London, England, and comes from a family filled with other writers--including his sister, mother, father, aunts and grandfather. He is the vice-chairman of the literary estate of his grandfather, Roald Dahl. He studied politics at Trinity College Dublin, Ireland, and writing at Dartmouth College. He lives and writes in the hills of New Hampshire. Visit him at www.LJRKelly.com. Yoko Tanaka is a graduate of the Art Center College in Pasadena, California and has illustrated several books for children, including the New York Times bestseller, The Magician's Elephant by Kate DiCamillo. Yoko lives in London, England. You can visit Yoko at www.yokotanaka.com.